GKhair began with our vision and our values. From the start we’ve been the leader in “the science of hair”. The concept is very simple; develop and deliver new and creative ideas to a global marketplace. GKhair is the first and only company to harness the beauty benefits of Juvexin. The GKhair Hair Taming System with Juvexin restores hair by repairing and providing long-term conditioning and protection. 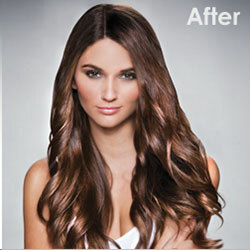 Juvexin is GKhair’s foundation in creating manageable, frizz-free, beautiful looking hair for all those who want it. Juvexin is a special blend of proteins and peptides optimized specifically for hair. It is developed specifically to protect and restore the hair back to its youthful state and is used in all GKhair products worldwide.